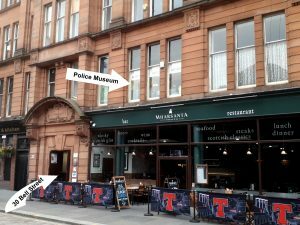 The Glasgow Police Museum is an independent museum set up and manned by volunteer members of The Glasgow Police Heritage Society (Scottish Charitable Incorporated Organisation No. SC029614). It is supported entirely by public donations. Click here to view the museum’s 2018 accounts. Brochure: Click here to DOWNLOAD our brochure which shows our location, opening hours and other information. Entry to the museum is FREE and if you enjoyed your visit and wish to make a donation towards the upkeep of the museum, this would be appreciated. Press button “1/1” in Entry System at main door to enter building. Choose stairs or an elevator to the 1st. floor. From High Street – follow the Brown Tourist Signs westwards along the left side of Bell Street and cross Albion Street. 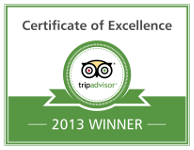 The museum is 20 metres on your left. See directional signs on litter bin and on the doors indicating the entrance foyer of 30 Bell Street. From Trongate – Two Brown Tourist Signs on Trongate direct you northwards up either Candleriggs or Albion Street. At Bell Street follow the Brown Tourist Signs. See directional signs on litter bin and on the doors indicating the entrance to the foyer of 30 Bell Street. 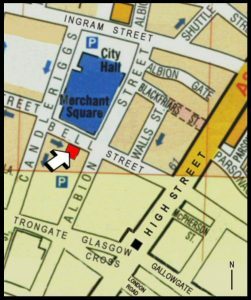 From Ingram Street – Walk down Candleriggs to Bell Street, turn left then follow the Brown Tourist Sign on south (right) side for 40 metres. See directional signs on litter bin and on the doors indicating the entrance to the foyer of 30 Bell Street. Bell Street is ONE WAY for vehicles from Candleriggs to Albion Street (eastwards). Candleriggs is also one-way southwards from Bell Street. Vehicle parking limited to ‘Pay and Display’ bays in Bell Street and surrounding streets. There is also a multi-storey (pay) car park in Albion Street. to 1 st. floor. The rest of the museum is one level. Toilets but no ‘disabled toilet’. The Glasgow Police Historical Exhibition contains artifacts and text boards which provide a historical insight into the people, events and other factors which contributed to the founding, development and progress of Britain’s first Police force, the City of Glasgow Police from 1779-1975. The International Police Exhibition in the museum illustrates the spread of policing throughout the World. Over 2000 items of insignia, headgear and uniforms from every country in the World are on display. Click here to Visit the International Police Collection Website.